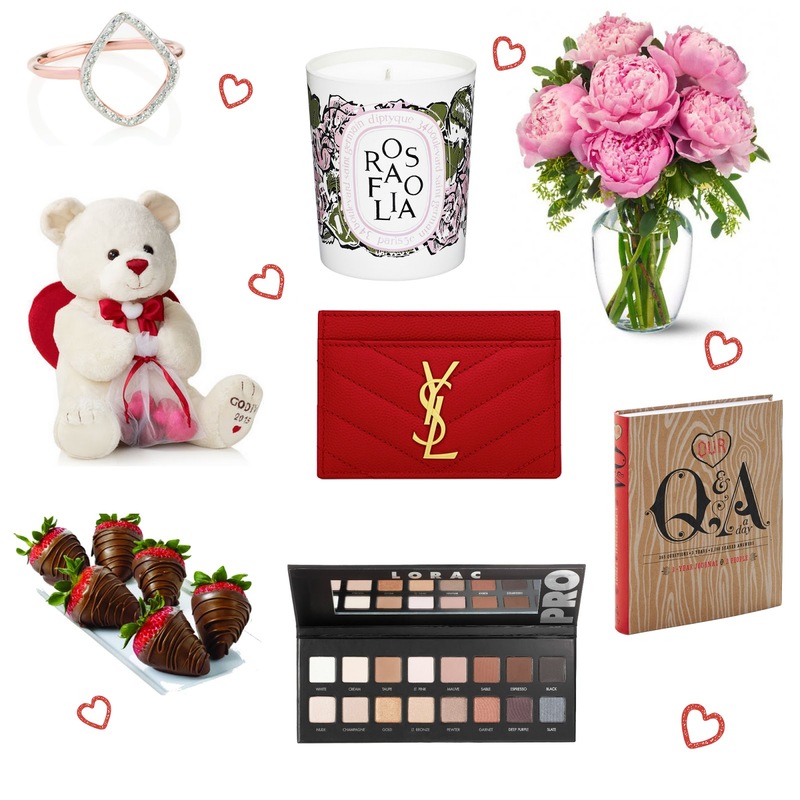 Valentine's day is around the corner and I decided to pick out a few bits and bobs that would be the perfect gifts for your loved one! I have a mix of things that one can buy, whether its beauty, jewelry or something more romantic/thoughtful! This is a quick guide for the women in your life! I will be doing a men's guide soon! I am literally obsessed with all of this stuff and I think anyone would love these gifts! Monica Vinader Riva Diamond Hoop Ring: You can't go wrong with a nice piece of jewelry! I know Tiffany's is such a classic for good quality jewelry, especially on Valentine's day, but I love discovering new jewelry designers! Monica Vinader is one of those! She has such unique pieces that literally look amazing with whatever you wear. They are a modern and chic twist to your usual jewelry, and have the plus point of being made out of great quality which is what I look for! Plus, I am a ring obsessor! I literally want to buy all her stuff. Diptyque 'Rosafolia' Candle (Limited Edition): These candles are amazing!! If you want your house to smell like heaven, Diptyque can do it for you! These candles are like no other candles I have ever smelt. You can just tell that they are made of quality and a lot went into making them. They have a very good scent throw and even though these babies are pricey, they are worth it. Rosafolia's scent is a fresh green and rose accord intermingled with ivy! I am sure any lady would love this! Favorite Flowers: Flowers are something every girl loves(am I right ladies?) I love receiving a fresh bouquet of flowers and it just makes my day better(the little things in life peeps!) Get your loved one their favorite flowers! I love peonies, tulips, hydrangeas and so many more!! Even if you can't do something big or can't meet them, send some flowers! Godiva 2015 Valentines Day Pierre the Bear by Gund: A cute little bear with some chocolate is always a cute gesture! I love Godiva chocolate and the stuffed bear is a plus(great to snuggle in case you can't meet each other)! Saint Laurent Monogram Credit Card Case: Fancy!!! Even though I have a wallet, a card case is so handy, especially this gorgeous one. I know, its pricey but it's a designer piece and did I mention how beautiful it is! YSL has the most gorgeous and classic stuff and your lady will be over the moon with this. It come's in two other colors(black and fuchsia)but the red is perfect for Valentine's day! Our Q&A a Day: 3-Year Journal for 2 People: I have a five year journal like this, but this is perfect for you and your significant other. This Q&A a Day provides a question for every day of the year, with enough space for two people to jot down a one or two sentence response. It is a fun way for both of you to engage in something together and can look back at it later! So cheesy but so cute! Lorac Pro Palette: Beauty lovers! This gift is perfect for someone who loves makeup and enjoys trying new stuff. The good part about this palette is that its neutral, which will work perfectly with every skin tone and taste! I have heard such amazing reviews about this and still need to get my hands on it. It has a gorgeous mix of colors, which include matte and shimmer. Godiva Milk Chocolate Dipped Strawberries: Who doesn't love chocolate covered strawberries?! For those sweet tooth's out there, they will love these! Godiva has the most delicious ones and are the best for Valentine's day! My mouth is watering now! I hope you enjoyed this post and it helped some people! If you are a lady and your man isn't sure on what to get for you, show him this post! Haha! I wish you all have an amazing Valentine's day! Even though it's considered a day for your significant other, spread the love around, everywhere! Let me know what your getting your loved one? Also, my men's gift guide for Valentine's day will be up soon! Yes on the Diptyque, peonies, and chocolate covered strawberries for Valentine's Day! Will happily pass on on this post to my boyfriend so he can get a hint haha! Thank you for sharing! Mine too! I am glad you liked it! :) Thank you for reading! I thought the diamond hoop ring seemed like a nice gift but I felt that one of the most intimate gifts was missing, lingerie. Valentine's Day is about celebrating each other. At http://theenclosed.com/ (The Enclosed), they provides a subscription based service that delivers luxurious lingerie to your partner, check it out! She will love it because of how beautiful she will feel especially on Valentine's Day. My girlfriend loved getting her gift monthly.